When I was a kid most of our vacations involved driving. There were many weird little tourist trap things we saw along the way. I think my favorites were stores that had giant fiberglass sculptures out front to attract attention. I remember cows, lumberjacks and dinosaurs. Too bad we don’t get that kind of stuff in the land of suburban strip malls. We used to have the car kabob but unfortunately that got torn down a few years ago to build a Walgreens. Today’s Maximumble gets back to work. Maybe it’s “Evil Genuous” week 😉 Super Villain week would suggest he has super powers. In Albuquerque, we have a “1 % for art” program that usually puts out pretty good art, but occasionally puts out something that would leave Dada scratching his head, such as the “chevy on a stick,” the aptly named “What is it?”, or UNM’s “Center of the Universe,” which is three rectangular concrete tunnels arranged at right angles to each other. We need better tourist traps. I predict that clicking my name will provide a very appropriate song. Great, now I have a Weird Al song stuck in my head. Biggest Ball of Twine in Minnesota. Now you’re just stringing us along. Wedding anniversary? What? Biff’s is married? Did I miss the invitation? Alas, my parents didn’t stop at any of the small ones. Only South of the Border (in S. Carolina on the state line with N. Carolina along I-95). Of course, SoB is awesome!!! @RS, I’m glad you noticed, too. I thought I was the only one. I missed Biff until I went back up to look at it. Yay for me. Will we ever see Mrs. Biff? We just have people advertising themselves through comedians. Did you ever pass through Joseph City in AZ and see the Jackrabbit? We actually live not too far from there. Also, does Mrs. Biff have uber eyelashes instead of eyebrows? @RS: Biff is married to his career. I’ve got to say, you’ve got the plexiglass housing in Darwin, MN down to a T. Made by Francis Johnson, circumference 40 feet, 12 feet high, 13 tons, created with one man’s labor and block and tackle. They even have it on every city street sign! 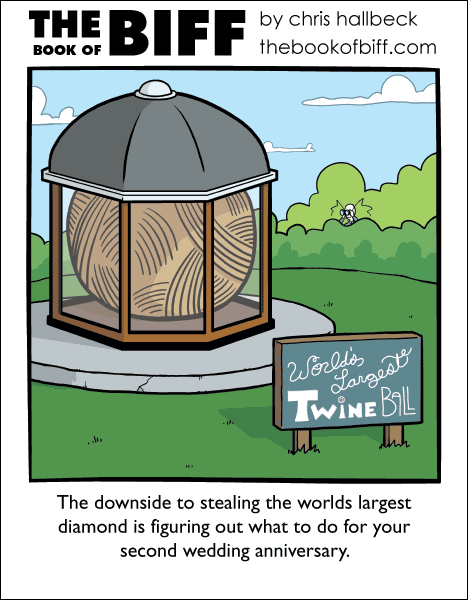 It should be “world’s largest diamond”, there’s an apostrophe missing. There sits the biggest ball of twine in Minnesota!